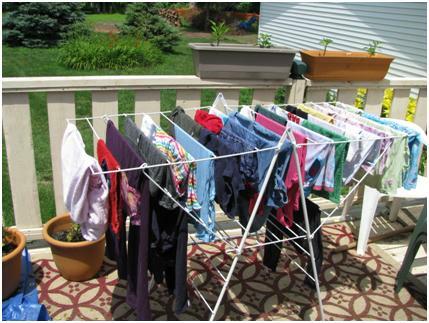 Everybody knows that hanging you clothes out on the line instead of using your dryer saves you money. But did you know there are health benefits to line drying your clothes? Here’s a list I came up with (while hanging out a load of wash). Experts say you need 5-30 minutes of sunlight twice a week without sunscreen to receive the vitamin D you need. Spending a few minutes hanging each load will more then get you the dose of vitamin D you need. Elevate your heart rate. Lugging a basket full of wet clothes is quite the workout. For me it’s up a flight of stairs, through the back door, down three stairs and thirty feet over to the clothes line. Then it’s up and down, up and down, grabbing a new item to hang up. By the time I’m done I’m a little winded. It’s free quiet time. Do you ever just need a minute of peace and quiet, a little mental health break from your dear children? They may express utter excitement to help you at the beginning of the day, handing you clothes pins and the like, but give them five minutes and they will be bored and leave you alone for the rest of the day! Spiritual Health. It’s a great time to get some one on one time with God. Depending on where you live, you can even talk out loud without worrying about someone hearing you. Chase those blues away. According to nutrition.about.com, in order to keep your serotonin levels up, you need 30 minutes of sunlight each day. Serotonin is what regulates whether you feel super good or depressed (i.e. its a mood regulator). Hang a couple of loads of laundry and you are there. Do you have any other health benefits to add? Have you experienced any of the benefits listed above? Rosalyn-Yes, the car is a great place for out loud praying as well. I love hanging my diapers out to dry! I love the uniform look that have hanging all in a row.